Showcase pictures of your products directly in the Google Display Network. This is an excellent way to draw attention to your offer by making it stand out from among the text results. This tool helps achieve the highestsales profits, perfectly complementing your AdWords campaign. GMC is integrated with your online store database. 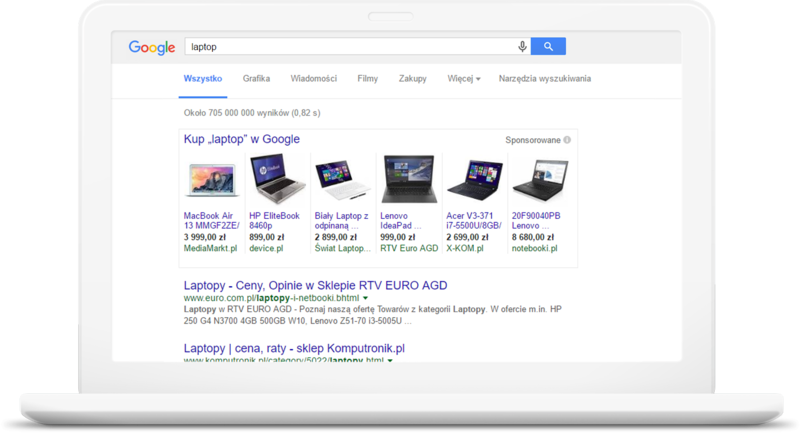 It allows for efficient transfer of information about your products for saleto the Google search engine (description, price, photos). It also lets you selldirectly from the search result list, helping you attract new customers! To begin our cooperation, we will requireto access your files with the product list (txt / xml). We will help you fully integrate this tool with your online store. We will monitor your user behavior and the results of our actions. Give us a call at +48 870 820 0058 or fill out the form below!